The CLAWS [Complementary Low Altitude Weapon System] provides a low altitude air defense capability based on the M1097 Heavy High Mobility Multi-Wheeled Vehicle (HMMWV) as used with the Avenger Air Defense System and current Department of Defense (DoD) inventory missiles. The system consists of the M1097 HMMWV, a minimum of four Advanced Medium-Range Air-to-Air Missile (AMRAAM) missiles mounted on a launcher, missile interface equipment (to include an uplink antenna), remote terminal unit(s) (RTU), a geographical location positioning system, a Global Positioning System (GPS) receiver, SINCGARS radio(s), and an organic reloading device. All components are contained in/on the vehicle. CLAWS has maximized use of government off-the-shelf (GOTS), commercial off-the-shelf (COTS), government furnished equipment (GFE) and non-developmental items (NDI). The system can be powered by internal and/or external power sources. It is manned by a crew of two Stinger Gunners from the Low Altitude Air Defense (LAAD) Battalion, who function as the vehicle commander/gunner and driver. The CLAWS will provide sufficient mobility to keep pace with supported maneuver elements, carry its own weapons and support equipment, and be capable of engaging targets within minutes. In order to successfully execute the OMFTS concept, Marine combat forces will require greater combat effectiveness over larger sectors of the battlespace than is now possible. Marine ground weapons systems today lack mobility because they are heavy, are costly to employ, and impose a significant logistical burden thereby hindering maneuverability courses of action available to the tactical commander. Current ground weaponry technologies simply do not allow the range effectiveness and operational suitability required by the OMFTS concept. The future battlefield will require highly lethal and mobile infantry units. Lightweight and durable weapon systems with improved effectiveness (range, lethality, and accuracy) are needed by Marine Combat Forces. Marine Air-Ground Task Force (MAGTF) must maintain freedom of maneuver to position itself, and the capability to effectively engage the current and emerging air threat which includes cruise missiles (CM), unmanned aerial vehicles (UAV) and FW/RW aircraft. Current MAGTF ground based air defense consists of Stinger surface to air missiles. Stinger MANPADS and Avenger fire units provide effective close-in low altitude air defense against FW/RW aircraft, but the Stinger missile's range is limited and does not provide reliable cruise missile defense (CMD). The Stinger missile also lacks the ability to engage very low altitude, low cross section targets in clutter. A new low altitude weapon capability, with extended range and improved effectiveness against the threat, is required to complement the current Low Altitude Air Defense (LAAD) battalion Stinger missile capability. CLAWS (Complementary Low Altitude Weapon System) will provide a rapidly deployable, high fire power, all-weather, stand-off air defense system capable of defeating threat aircraft, CM and UAV's beyond the range of currently fielded Avenger and MANPADS fire units. HUMRAAM, five highly lethal AMRAAM missiles on a mobile HMMWV launcher, is a material solution to the CLAWS requirement. The primary objective of this task is to adapt the AIM-120 Advanced Medium Range Air-to-Air Missile (AMRAAM) into a ground-to-air missile capability. HUMRAAM will be evaluated with respect to the CLAWS ORD and enhanced as necessary to be compatible with USMC air defense force structure and command control. Technical objectives include: use the Avenger HMMWV as the host platform; develop software for the Expeditionary Air Defense System (EADS) Remote Terminal Unit (RTU) and Ground Based Data Link (GBDL) to support weapon control, acquisition, and launch; receive cueing from all available Marine Air Command and Control System (MACCS) sensors e.g. CWAR, AN/TPS-59, CEC/JCTN. CLAWS will provide an adjunct to the LAAD battalion that will offset Stinger missile deficiencies, extend SHORDAD engagement range, and provide an effective capability against the cruise missile threat. This low risk concept will maintain the high mobility required for organic protection of maneuver elements. The requirements for this effort are found in the Mission Need Statement (MNS) for the "Advanced Low Altitude Air Defense Weapon" dated 30 Dec 92, and the "Mobile Surface-to-Air Missile System" dated 9 Feb 93. 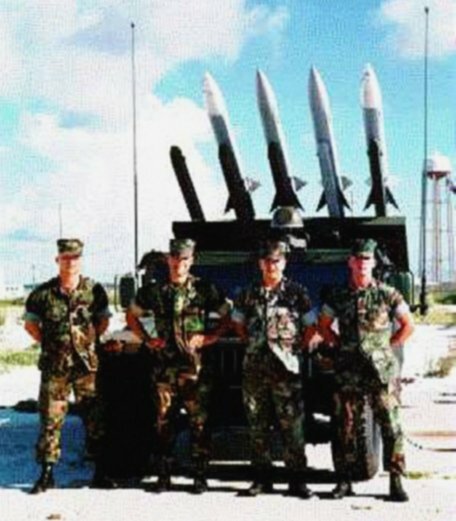 HUMRAAM directly responds to the Operational Requirements Document (ORD) Number 92364DA: "Complementary Low Altitude Weapon System (CLAWS)" of 18 February 1998. The CLAWS concept evolved from a AMCOM/RDEC initiative to develop a low cost, high mobility, advanced low altitude missile capability using Horizontal Technology Integration (HTI). The primary goals are to: use an unmodified Avenger HMMWV; be compatible with Avenger force structure and command and control; and be C-130 transportable. AMCOM was the lead agency in a now completed proof-of-concept demonstration of HUMRAAM (FY97). In August 1997 the first of several live fire demonstrations were condicted using AMRAAM launched from a USMC HMMWV (High Mobility Multi-Wheeled Vehicle--fancy name for an updated Jeep!). The Marines and Army at Redstone Arsenal have been working to put together a highly mobile ground laucher usable by US forces for launching AMRAAMs at cruise missiles, helicopters, and fixed-wing aircraft attacking ground forces, aircraft, POL storage sites, etc. The Marines brought the ground radar, the Army furnished MQM-107 targets, the Navy paid for the range costs, and the Air Force provided the missiles. The first test resulted in a direct hit even though there was no warhead on the missile. In September another test included an Aegis cruiser equipped with CEC (Cooperative Engagement Capability). With the very powerful SPY-1 radar on the ship, linked to a Marine TPS-59 radar on shore, a very accurate air picture was established. The AMCOM/RDEC proof-of-concept demonstration of a ground launched AMRAAM provided evidence of the feasibility of using the Avenger HMMWV platform, successful integration into EADS (RTU, GBDL), ability to receive cueing from MACCS sensors over existing C3I, and the ability of the AMRAAM missile to engage the required target set. The Marine Corps will conduct a follow-on ATD starting in FY98 that will advance the HUMRAAM development to provide a full-up integration into EADS. AMCOM will deliver 2 HUMRAAM fire units in 2Q FY99 for Marine Corps operational suitability and effectiveness testing. The HUMRAAM approach will maximize use of NDI including an unmodified AMRAAM missile, Avenger HMMWV, and EADS components such as the RTU. The sophistication of the AMRAAM missile will be exploited to keep the HUMRAAM launcher concept simple. Compatibility will be maintained with the Avenger force structure, especially in the areas of high mobility and manpower requirements. HUMRAAM will use existing MACCS sensors and C3I network assets. An open architecture will be adopted to facilitate interface with emerging fused sensors/data links such as CEC and JCTN. This ATD project will provide the design and performance data base for the smooth transition into the DEM/VAL phase of projects being transitioned to the MARCORSYSCOM PM. The HUMRAAM effort is fully coordinated with and will transition to the PM for Air Defense (C4IAD). 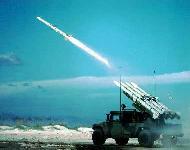 HUMRAAM will be fielded with the LAAD battalion to augment Stinger missile SHORAD capability. By design, HUMRAAM will be compatible with USMC air defense force structure and command and control. HUMRAAM's horizontal technology approach and use of NDI should facilitate an abbreviated EMD phase resulting in a MS I/II decision by early FY02. The proposed effort will incorporate advances made from considerable investment and progress under Army, Marine, and Marine Corps programs. 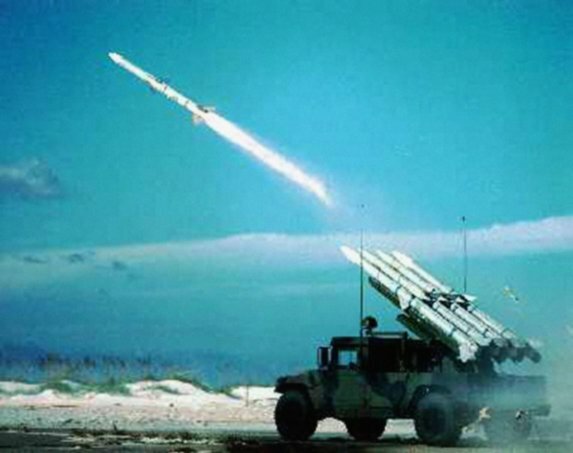 HUMRAAM is based on the Army/USMC Avenger fire unit's HMMWV, and the AIM-120 Advanced Medium Range Air-to-Air Missile (AMRAAM) - both active programs. This effort is an outgrowth of AMCOM/RDEC's "Program 559" to develop a high mobility, ground launched version of AMRAAM based on the Avenger HMMWV that would cost $559K. Although AMCOM is the lead agency in the HUMRAAM proof of concept demo, future application within the Army's Forward Area Air Defense (FAAD) structure is uncertain. The Norwegian Air Force has fielded a ground launched version of AMRAAM called the Norwegian Advanced Surface-to-Air Missile System (NASAMS). The Complementary Low Altitude Weapons System (CLAWS) Program will produce a rapidly deployable, high fire power, all-weather, stand-off air defense system capable of defeating threat aircraft, cruise missiles, and unmanned aerial vehicles beyond the range and capability of currently fielded Marine air defense systems. The CLAWS shall be sufficiently mobile to maneuver with mechanized ground assault forces, carry its own missile ammunition and support equipment, and transform from transport mode to firing mode (and reverse) within mandated time constraints. The CLAWS will be operated by a two-man crew and maintained and supported within current Marine Corps maintenance and support concepts. The intent of this program is to leverage industry experience with comparable missile programs, as well as independent research and development accomplished by both industry and government, to deploy a "proof-of-concept" capability (e.g., two systems) within an initial twelve (12) month delivery cycle, capable of meeting (minimally) threshold performance requirements. Concurrent with user evaluations and limited testing (e.g., safety, environmental, operational scenarios), two additional production representative systems shall be produced within the following twelve (12) months that exceed threshold performance in key areas, demonstrate operational and supportability improvements, and establish the production configuration baseline. The combined performance period for both phases shall not exceed twenty-four (24) months. Following completion of operational testing and certification, inclusive of rework of the "proof-of-concept" systems, production options for a minimum of twenty-nine systems shall be exercised. The intent of this program is to rely upon proven Non-Developmental and commercial technologies and engineering expertise to achieve program objectives, while allowing the contractor latitude to structure a program commensurate with the maturity of their product and level of confidence in their management/business approach. The contractor shall deliver two (2) CLAWS "proof-of-concept" units within twelve (12) months of contract award, and, at a minimum, two (2) additional "production representative" systems during the following twelve (12) month period. Production requirements, inclusive of baseline system configuration and quantities, shall be fully defined prior to completion of the twenty-four (24) month schedule. Rework of the "proof-of concept" units shall be included in the twenty-four (24) month performance period, resulting in a total of four (4) production representative systems. The contractor shall propose and deliver the "proof of concept" missile systems compliant with, at a minimum, the threshold requirements stated in the Performance Specification. The ability of the systems to accomplish anticipated mission requirements and operational scenarios, as well as comply with the overall program schedule shall be supported with empirical evidence. Such evidence (e.g., commercial specifications, performance data, test results, etc.) shall ensure technical compliance of the system to meet performance standards while reducing cost and schedule risk (e.g., reduced testing, improved reliability, etc.). The contractor shall demonstrate that any "value added" capabilities (e.g., demonstrated cost savings or performance/supportability enhancements) exceed threshold performance, reduce total ownership costs, or contribute to improvements in program execution. Similarly, any areas that are non-compliant with performance standards shall also be identified, along with an approach to mitigating impact and achieving operational employment of the system. The scope of this requirement also includes delivery of contractor logistics support and user/maintainer training throughout the pre-production period to assist with initial testing, user validation, and operational capabilities assessments.